In a recent article in University of Illinois Farmdoc Daily, a group of University of Illinois agricultural economists along with a colleague from the Ohio State University looked into the factors that play a role in explaining price movement in cropland prices. In summarizing the results of their research, the group pointed out that "land rents were twice as important as declining interest rates to the increase in cropland prices between 2003-2006 and 2015-2016." However, they point out that, "Higher interest rates clearly generate headwinds for cropland values and increase risk for cropland buyers, owners, and lenders." The last point of the article was to look at the entire cropland price picture when trying to predict land price movements. "It is important to watch interest rates but also important to watch rent and other factors that impact cropland prices, and in particular are the three sets of factors reinforcing each other or offsetting each other." Source: Zulauf, C., G. Schnitkey, J. Coppess, and N. Paulson. 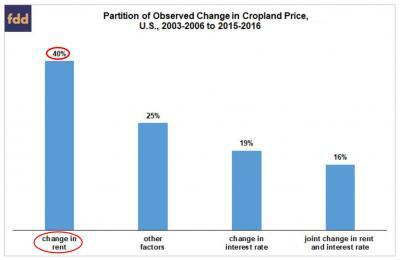 "Interest Rate and Current U.S. Cropland Prices." farmdoc daily (8):64, Department of Agricultural and Consumer Economics, University of Illinois at Urbana-Champaign, April 11, 2018.